Who Is She: wife, mother, facilitator of information, inspiration, and empowerment, advocate (and accountability friend) of black women's wellness. Mantra: Our Health is Our Wealth. Be Your Own Kind of Beautiful. Personal Note: Speaking of Beautiful... My first encounter with Lisa was over 5 years ago. Looking at her picture on a Ning, I thought, wow she is so beautiful. Well, we started interacting, and her heart out shone her face. 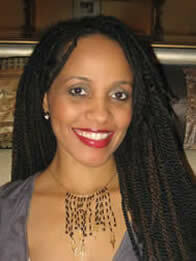 Roberta Peyton's (mother) health story motivated Lisa to start a dialogue amongst black women, online. Lisa's message and mission resonates with me--a woman should be as vigilant about her physical and mental health, as she is with family and business/enterprise. As we pursue our life's calling and our various endeavors, we must first take stock of the fact that without good health our dreams and aspirations are merely fragile fantasies. Poor health can and will derail the best and brightest of plans. Ultimately I decided to say what was on my heart and to trust that the message I intend to convey is received in the spirit of love, care and urgency in which it is offered. How do I stay connected to this fabulous Light?